The fight between online and offline retailers is getting murkier. Given that online retailers are offering products at rock-bottom rates, it is getting very difficult for their offline counterparts to compete. Consumers are increasingly buying their products online and offline business is getting severely affected. Now, offline retailers who are generally channel partners for product manufacturers, also double up as their service centres. Because of fierce competition from online vendors, these channel partners have no option but to stop selling the products, or go in losses. So, how does manufacturer pacify their channel partners? By telling them that they will not be responsible for any warranty support for products that have been bought online. In short, customer who has bought a product online does not have any warranty for the product. A friend of mine who is a NetGear channel partner recently got this email from the manufacturers’ channel manager stating exactly the same. Though the channel partner who got this email is an offline retailer himself, even in his opinion, this was a very surprising move by NetGear and extremely damaging from consumer’s point of view. All online retailers like Flipkart, Infibeam, Amazon and others clearly mention that the product consumers buy online are covered by warranty offered by the manufacturer. 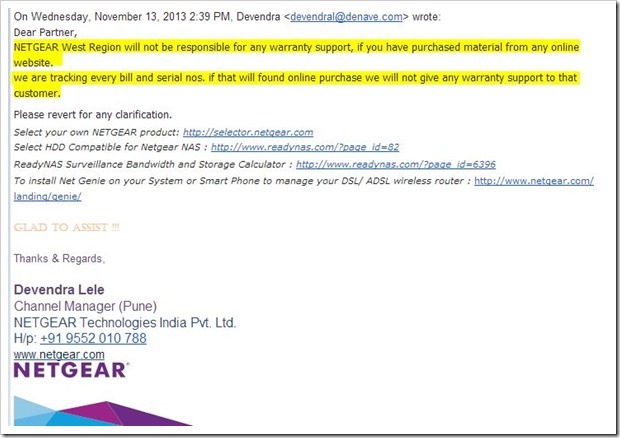 Here is what Flipkart says when it comes to warranty for most NetGear products. From a consumer point of view, the situation is scary because once Flipkart (or any other online store) has sold the product to you, they will obviously wash their hands off the product saying, “it is responsibility of the manufacturer”. However, as you can see from the mail given above, manufacturer will also not provide the warranty! What does the consumer do in this case? "Pitfalls Of Online Purchases: NetGear Flatly Refuses To Offer Warranty On Products Purchased Online", 5 out of 5 based on 1 ratings. Motorola Coming Back To India With Moto G & Moto X! This is highly unlikely. Maybe the person who wrote the email didnt understand the issue or his choice of wording is wrong leading to ambigous meaning. Apart from the illogical decision even if We assume it is true it is almost impossible to implement. The reason being these days almost all websites are marketplaces. Ebay, flipkart, snapdeal, homeshop etc. Most retailers on these websites are offline retailers as well. Now when the product is being billed to offilne retailer who is selling it online where does the online webstite come in between. When you make a purchase from ebay or homeshop18 the seller would give a bill which would have the name of his company and nothing is mentioned about ebay or homeshop. I believe the same is the case with other ecommerce websites. Therefore when the invoice is of offline retailer the product was billed to offline retailer how would netgear differentiate even if they plan on implementing the policy. It’s really a scary news, because we all are moving towards online purchase specially for the gadgets and other techy products. Don’t worry we will support in chargeable. Interesting responses – I used to be in IT sales channel for a few years before moving on to Enterprise Architecture and Consulting. 1. Netgear, HP, Nikon etc – none of them ever believed that ecommerce will take off in India; and have had strategies in place only for sales via channel. 2. Channel sales are getting hit due to better price being provided by online retailers. 3. Channel dealers are now complaining to the companies about margin pressures and the fact that all these companies need a minimum of “x” number of boxes sold each month to continue to be dealer; and remember some of these dealers have created entire business on a single brand. 5. Warranty in India is a joke. Ever asked any company to support International warranty ? No one does it. How do you expect them to support so called India warranty when the stronger and more strict International warranty is not supported. Something like this would result in a class action suite in Europe and/or the US. The only solution for these companies is to “get with the program” – I suggest they take a leaf out of Dell India’s strategy of supporting both channel as well as online Sales. After reading the mail once again, it seems NetGear is saying if channel partners (offline retailers) get their wares from online they will not provide warranty. You said this email was received by a channel partner and not by a consumer. May be some channel partners are getting their NetGear products not from NetGear but from some other sources and selling them and passing on the warranty to NetGear. In that case it makes sense. There are many sellers on eBay who are selling products which are way cheaper than the market price even cheaper than online retailers. But those are seller warranty products. But what if some offline seller buys such products in bulk and resells it under his bill? Or what if someone imports it directly through channels like Alibaba? This looks more about the channel partners themselves than consumers. I agree with you here. Seems to me too that this is with reference to the channel partners selling stuff bought from an online retailer. But if NetGear is thinking in line with what the author is suggesting, then they’re in for a nasty surprise. For a moment lets agree with your line of thought. I am the end customer and i have no clue were the channel partner got the device from. the device breaks, I ask for warranty -> now if the channel partner got the device thru the channel my warranty is supported; but if he bought it online and resold to me it is not ?? How on earth would I as the customer know that ? So effectively these companies are saying you buy are products but we support only when we feel like it!!. The margin would be non existent if channel partner bought online and resold locally. In many cases the street price of a product is far lower than what is shown online or printed on the box. Remember it is MRP (maximum retail price) that is printed. Street prices are 10 to 15% lower and for cross channel sales it is almost 20% lower with 30 days credit. No online retailer can match that. This is scary but if you have a proper VAT paid bill and the item is not a gray market item (imported through unofficial channel) then there is no way the manufacturer can deny warranty. I think this will apply to some of those items sold on eBay that carry seller warranty. Online is becoming big. It is the future. No manufacturer can afford to not provide warranty to products sold online. I am sure if FlipKart stopped selling NetGear products some heads at NetGear will turn. @Yash what you say is right… and I agree… But see the mail from channel manager properly.. He says, we are specifically tracking all the invoices and bills for products sold online.. They can easily say that Flipkart is not an official channel partner..I forgot to add one point in the article..
Few days back Nikon had officially announced that Flipkart and SNapdeal are not their authorized partners… See the announcement here.. So what does a consumer do then.. Right but Nikon didn’t say they won’t provide warranty. Flipkart/Snapdeal might not be authorised partners but what is preventing Flipkart from buying from an authorised Nikon distributor and retailing it? Flipkart is a retailer. Tomorrow if I open a camera shop, I can buy from any authorised Nikon distributor and sell it. Whether I sell it online or offline does not matter. I bought it from an authorised distributor and paid necessary taxes and I am providing a proper VAT bill to the end customer who buys from me. There should not be any issue of warranty. Imagine I have a bill VAT paid, its not an Indian bill but one from a Best Buy in San Jose. The box and documents that are given tell me that I have international warranty. – This is not bought in grey market, it is purchased from the companies outlet, thru their channel. Do you believe that warranty will be supported in India ? The Indian counterpart calls this purchase as grey market – and refuses to support. It disgusts me that the channel and the parent companies will term legitimate purchases as grey. When these same companies are to blame by creating differential pricing. Purchasing IT equipment – Cheaper in the US, add customs, freight and whatever you can think of and it is still cheaper than the prices that are offered in India. A lot of IT vendors actually bill from outside India when it is a large project that needs to be executed – esp if the project is for a export based company. It is conveniently termed as legitimate enterprise sales and warranty support provided. I will stop buying netgear products & switch to some other brand. That’s right. Customers who have fled online aren’t coming back. These tactics only mean you are hurting your sales. Another tactic used by Companies is to give additional warranty when purchase from Offline sellers. When I purchased my Asus laptop I noticed that for the battery I was getting 1yr warranty whereas if I purchase the same from Flipkart I would get only 6 months. In my case its understandable but Netgear flatly refusing warranty is atrocious. I don’t have issue with this case.. The reason being, buyer knows that he getting 6 months warranty if they buy online. Here the situation is scary because, online platforms say that manufacturer is giving 2 years warranty, but they do not give it..What does a customer do then?